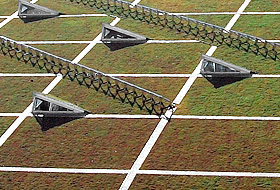 Schiphol Plaza (central terminal) at Schiphol Airport in Amsterdam is the first building in the Netherlands to combine green roofing with a solar energy system. 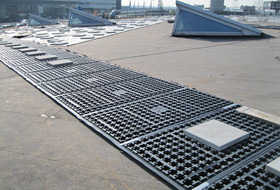 With anti-slip mat: ZinCo supplied the laminated drainage sheet Fixodrain® XD 20 with an additional rubber protection layer on the underside specially for Schiphol. Roof penetration: Solar Base SB 200 elements are used for the subsequent installation of the solar modules and are held in place by the ballast provided by the roof substrate. Using silo vehicles, the system substrate "Sedum Carpet" is blown onto the roof where is it immediately distributed. 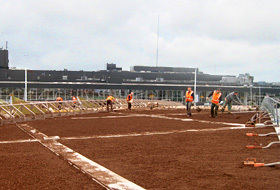 The roof substrate provides the required ballast for the Solar Base panels and is carefully levelled to create a good basis for the "Sedum Carpet" plant mats. The pathways for maintenance personnel run directly above the load-bearing support pillars of the terminal building. The Solar Base Frames can be set up either before or after the plant layer has been installed. Things were very flexible in this respect at Schiphol Airport. The existing roof pitch was not a problem when installing the rows of solar modules. The geometric arrangement of the rows of solar modules and the pathways between the skylights resulted from the load-bearing capacity of the roof. 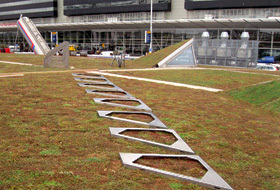 Green roofing plays an important role at Schiphol Airport. While the central departure terminal, Schiphol Plaza, has had an extensive green roof since the 1980s it was now in need of restoration. It was decided from the start that this newly-restored roof would also be protected by a green roof. 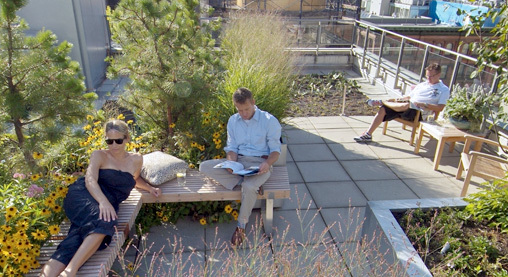 The photovoltaic system integrated into the green roof provides added value. 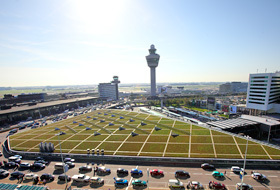 Schiphol Airport is now the first building in the Netherlands to combine solar energy and green roofing. The international commercial airport at Schiphol was the fourth largest in Europe last year with almost 50 million passengers and 1.5 m tonnes of cargo passing through it. In its development plan for the airport, the airport operator the Schiphol Group attached great importance to sustainability and, therefore, to issues of social compatibility, noise control and climate and environmental protection. In order to achieve the targets set in this respect, Schiphol works together with the Universities of Delft and Wageningen, the independent research organisation TNO, experts from industry and other partners. 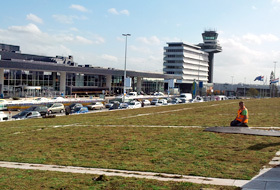 One of the building blocks in the wide-ranging endeavour to achieve sustainability is the green roof, which was enhanced with a photovoltaic unit in an exemplary manner in Schiphol Plaza. Schiphol Plaza is the main terminal and the focal point of the airport. The roof is approx. 8600 m² in size, has limited load capacity reserves and a roof pitch of between 4° and 10°. It is slightly vaulted and slopes down towards the ground on all sides. Triangular skylights with a counter slope interrupt the roof area and are also greened. It became necessary to restore the roof as the existing insulating package, waterproof membrane and green roof based on rock wool panels could no longer function in the long term. The material “rock wool” lost a lot of substance over the years and as a result the plants were failing. A permanently reliable solution was now required. A technically secure and appropriate solution for green roofing and solar energy system was quickly found with ZinCo. However, the greatest challenge with this particular project was the execution of the works. 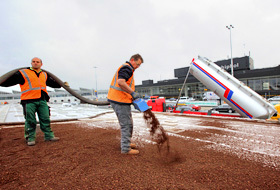 In order to keep the disruption of airport operations to a minimum, the works had to be carried out outside of the busy summer holiday period. The roof contractors Boko Dakbedekker, a cooperating partner of the Dutch organisation “Leven op daken”, and landscape gardeners Wieringen Prins Hoveniers from Amsterdam were responsible for this. As the roof is not structurally designed to carry construction equipment, the works had to be carried out manually for the most part. Once the old roof build-up was removed, a solid base was created using a root resistant, bituminous roof waterproof membrane. For the required combination of green and solar, ZinCo used the suitable system build-up “SolarVert“ with Fixodrain® XD 20. This system build-up is specially designed for large-scale roofs. It is based on the drainage and water retention sheet Fixodrain® XD 20, which has a pre-laminated filter sheet on the upper side and is supplied in rolls. In order to address the issue of roof pitch, a rubber protection layer was laminated onto the underside of the Fixodrain® XD 20 sheet as an anti-slip device. Thanks to factory production, the system manufacturer ZinCo was able to offer this minor modification as a building-specific solution for a large project of this kind. Therefore, the roof area was prepared in one pass for all eventualities. The second element in the “SolarVert” system build-up is the Solar Base SB 200. The Solar Base is made of ABS plastic and is approx. 100 x 200 cm in size. It has water retention cells and drainage channels on the underside and is used to secure the Solar Base Frame SGR 35/90 for the subsequent installation of the solar modules. As per plan, the Solar Bases were distributed across the roof in rows. Due to the limited load capacity reserves of the roof, the solar modules could only be positioned above the supporting pillars of the underlying terminal building. Once the Solar Bases were in place the substrate layer was added. The substrate was blown up onto the roof using a silo vehicle. The pre-calculated ballast provided by the roof substrate secures the mounting frames for the solar modules and holds them in place, even during a storm. This is a well-thought out system that eliminates the need for dangerous roof penetration or separate concrete weights as ballast. Thanks to the use of the pre-cultivated plant community “Sedum Carpet”, greenery is achieved immediately with this project. The network of paved pathways throughout the green area is intended to guide people who are carrying out maintenance and service work on the roof along “the right path”, that is directly above the load-bearing support pillars. The green roof provides not only the ballast required to anchor the solar system but also improves the efficiency of the unit, because a green roof provides for a lower ambient temperature than a bare or gravelled roof. It is precisely this effect that ZinCo has proven scientifically in a test facility. The measured values show that the temperature of a solar module above a green roof is on average 8 Kelvin lower than that of a module installed over a bituminous roof membrane. Given the fact that the level of performance of most solar modules depends on their operating temperature (rule of thumb: for each degree of heat above 25 °C, performance sinks by up to 0.5 %), this results in an increase in performance of 4 % at a temperature difference of 8 Kelvin. 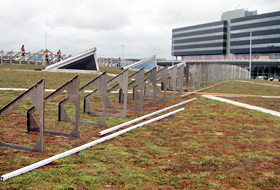 The client, Schiphol Group has a warranty of 10 years on the entire roof including the green roof build-up. In the unlikely event that problems arise during this period, the “Leven op Daken” partner, in this case the company Boko Dakbedekkers will ensure that any issues are addressed. Problems are not envisaged even beyond this period of time, as the green roof will provide excellent protection of the roof membrane from temperature fluctuation and, therefore, premature ageing. Other benefits of a green roof are rainwater retention, noise prevention, improvement of the micro-climate and the provision of a habitat for fauna and flora. Last but not least, the green roof build-up provides an anchor for the solar plant and helps to improve their performance by cooling the environment around them. The combination of green and solar is already very much in trend in Germany. 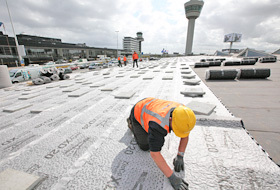 Schiphol Airport is now the very first building of this type in the Netherlands and is making a significant contribution to sustainability with its exemplary roof restoration project.